AAG Electric Motors & Pumps, Inc. is a woman owned, family operated corporation established in 1997 in Panama City, FL. We have grown with the ever increasing needs of our customers, striving to provide the highest quality service, products, and resources possible for our customers' satisfaction. Using the best quality products and providing our customers with the back up and support they desire, AAG can continue superior service and rapid turn around time to insure minimum equipment downtime. In 2007 we moved to a 20,000 sq ft facility to better serve our customers and in 2010 added a 3500 sq ft High Bay with a 15 ton bridge crane with an ever present test run floor plate and a 1000 sq ft burn barn. Now in 2014 with the merger of AAG and Bruce Environmental, we are expanding our service and distribution capabilities into the waste water industry. 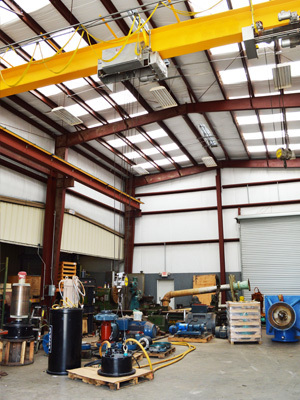 AAG Electric Motors & Pumps, Inc. is a complete pump shop and motor repair facility specializing in submersible pump repair, vertical turbine repair, centrifical blower repair, & rotating equipment. Our quality assurance and over 85 years of combined experience among our staff in pump, motor and equipment repair has made us a front runner in the industry all over the United States. All of us at AAG share a commitment to serving our customers promptly, efficiently and honestly. We pride ourselves on the excellent word of mouth promotion that we receive. We have a large customer base who know they receive prompt efficient service from our staff. By exceeding expectations, meeting customer needs and always delivering the highest quality products and services on time without error, we feel that we can continue to be an unquestionable leader in our industry. Our mission is to continue to be the leader in submersible pump and motor repair, provide warranty on our work, offer the latest in diagnostic tools and ensure a quality job. We understand the importance of this industry and strive to meet our customers expectations. 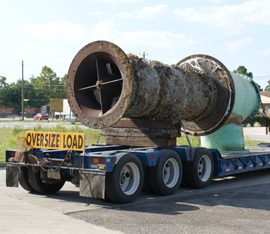 We have extensive experience in the water and waste water industry. Our involvement is vast and our fleet service team works with municipalities to offer a broad range of products and services for solving your specific water and waste water treatment problems. We also offer an extensive line of products and services to serve a variety of industry and commercial applications including power generation facilities, pump and paper mills, chemical plants, and water treatment facilities, agriculture, pool and spa, process cooling towers, and industrial markets and equipment. We are an active Electrical Apparatus Service Association member, better known as EASA. Doing business with an EASA member assures that your equipment will be repaired to EASA's exacting standards, using the latest equipment and techniques. EASA members are unquestionably the most technically advanced and qualified source for your electrical equipment needs, including repairs, rewinds, redesigns and new equipment. AAG Electric Motors & Pumps, Inc. stocks a wide range of electric motors, including single phase and three phase. We carry a diverse variety of electrical products, including hard to find brands. We are a distributor for drives, bearings, reduced voltage starters, magnetic starters, manual starters, overloads, switches, contactors, relays, & capacitors. We inventory replacement motors for air compressors, blowers, fans, conveyors, augers, pools, and farm duty applications any many orders can be shipped the same day. Below are the manufacturers that we are established with. Our prices are extremely competitive and our service dependable. For an immediate quote on motor and/or parts please give us call or fill out the request sheet and we will promptly get back to you either by phone, email, or fax. In addition to motors we also stock submersible pumps. AAG Electric Motors & Pumps, Inc. is the manufacturer's representative for USFilter and Davis EMU Products. Covering the Southeastern Region AAG represents EMU submersible pumps as the distributor and warranty repair center. USFilter is North America's largest water company providing the most comprehensive water services and technology for commercial, industrial, municipal and residential water and waste water treatment customers. EMU pumps are manufactured in both oil-filled and high-efficiency, air-filled configurations using well-known, proprietary designs. By using a variety of impeller and motor combinations, these tough solid handling pumps offer optimum life cycles in the harshest of conditions. Although these pumps are totally submersible, they are often used in dry installations or for portable dewatering.